The Commonwealth Games fever has reached O’Reilly’s! Stay two nights this school holidays from $189 per night and kids can join in the FREE Amazing Race activities. Despite where you live, it is possible to escape the Commonwealth Games hustle by travelling our suggested scenic routes this Easter and avoid the M1 Highway. Enjoy the scenic route and forget traffic jams with two tailored itineraries devised exclusively for O’Reilly’s day-trippers and overnight guests. Check out our tailored itineraries to easily access our Retreat via Brisbane or Northern NSW. Adventure Awaits – School holiday fun for the whole family! Jam-packed with animals and activities for the whole family – we can guarantee you’ve never had a holiday like this before. 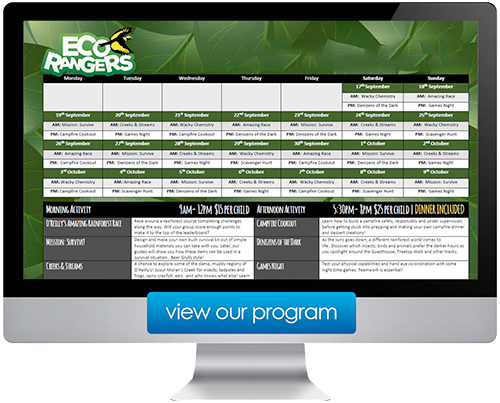 In addition to the free Amazing Race activities – check out the Eco Rangers School Holidays Program for details. Let our friendly staff keep your kids entertained these school holidays. We’ll tire them out while you sit back and enjoy the peace and quiet. Perhaps a massage at our iconic Lost World Spa? Note: Children must be at least five years old to participate in Eco Rangers OR accompanied by a guardian if under five years. The School Holiday Value Package is a great all inclusive package that promises to reconnect the family. One for the whole family … keeping the kids busy over the school holidays can be quite the challenge; so let O’Reilly’s take charge! While you explore Lamington National Park (or have a treatment at the Lost World Spa), the children are having the time of their life, learning and interacting with all the different wildlife, other kids and the environment. A minimum three night stay applies to this package. From $333 Per Night (2 Adults, 2 Children).